The blockchain and cryptry is probably the innovation of the decade and has the potential to change the whole Internet. In this book, however, we do not want to go into the blockchain itself, but to the currently second-strong crypt diet: Ethereum. Ethereum is similar to other cryptos, but it also provides some additional features. For example, one is able to create and execute intelligent contracts. This is a major breakthrough in the area of ? ?digital currencies. Ethereum therefore acts not only as a (crypto) currency, but can also bind individuals and organizations through intelligent contracts. Find out all the basics about Ethereum here; From creating a wallet and how to get to the crypt diet ethereum, right up to the mining (that is, the snarl) of the coveted ether. 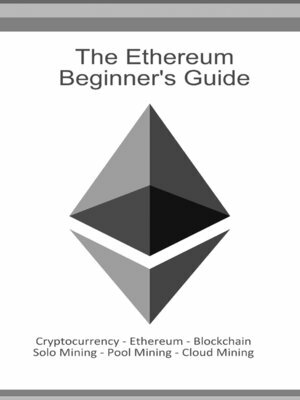 What you will read: - create and use a wallet - Ethereum buy, earn, transfer - Ethereum Mining - Ethereum Miner build - Ethereum Poolminer - Ethereum Cloudmining - Ethereum Solomining - Ethereum Mining Software The Ethereum Beginner's Guide, as the title suggests, is aimed at all those interested in Ethereum who want to enter the world of cryptosciences.